When Yorkshire decided to decorate for Le Grand Depart, it went all out with bunting, bikes and yarn bombing in a spectacular and as yet unrivalled bid to welcome the Tour de France to God’s own county. The effect was sensational but one property stood out from the rest after owners Tony and Lori Handley decided to cover their house in giant red spots in honour of the King of the Mountain jersey. 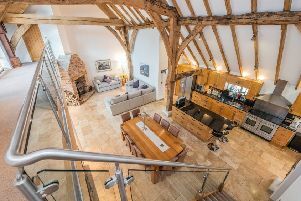 Now there’s a chance to own the landmark property as the four-bedroom home and its two holiday cottages are up for sale for £850,000 with Dacre, Son and Hartley. Mr and Mrs Handley are hoping that would-be buyers will continue to decorate the building and put a smile on the faces of passers-by. Since the red spots in 2014, the Royal Oak has been dotted with red noses, which raised almost £2,000 for Comic Relief. On Valentine’s Day, it was covered with hearts to help Visit Harrogate promote romantic breaks. To celebrate the 50th anniversary of the Great Knaresborough Bed Race, it was decorated with balloons and it sported Christmas trees to promote the 2015 Knaresborough Christmas Tree Festival. It was back to spots again in April this year when Le Tour de Yorkshire rode through Knaresborough. Tony Handley decroating his house with hearts for Valentine Day. Picture: Adrian Murray. The trimming up tradition started when the Tour de France route was announced. Mrs Handley, an artist, came up with the idea of decorating the house for the event. She wanted to turn it into a Yorkshire Tea tin but Le Tour organisers saw it as advertising so she settled on the spots. She also encouraged local schoolchildren to decorate T-shirts that were then strung up as 2.5km of bunting. “We realised the race would come right past our front door and we just knew we needed to get behind the event and raise the profile of our very special town,” said Mr Handley, a retired marketing expert and former mayor, also known as “Mr Knaresborough”. Welcome to Yorkshire has used the house to showcase and promote the region and the Handleys also won a Harrogate Hospitality and Tourism award last year in recognition of the property’s outstanding contribution to tourism. The Spotty House also boasts several more awards from Knaresborough in Bloom. The couple were worried about objections to their treatment of a grade two listed building but local people were thrilled with the attention-grabbing façade and planners were sympathetic as the decoration is not permanent. Although the spots appear to be painted on, they are stick-on vinyl discs, which cost £90, and are easily removed. The Handleys bought the property 10 years ago. They have since refurbished the main house, converted an old stable and tack room into holiday lets and have been instrumental in boosting the town’s profile. They are selling up to move to Northumberland so that Lori, who specialises in seascapes, will have more time to paint her favourite subject. The first written records of a property on the site are from 1726 in the will of Thomas Atkinson, who bequeathed his estate to his three children. It is not until 1781 that records show it being used as the Hare and Hounds Inn. The first reference to the Royal Oak is in 1826. It was sold to John Smith’s Brewery of Tadcaster in 1925. Knaresborough Folk Club was founded at the Royal Oak in 1974 and in 1986 it was registered by Harrogate Borough Council as a Building of Special Architectural or Historic Interest. It was delicensed in 1997 and was sold as a private dwelling. The Handleys bought it in 2006 and it shot to fame in 2014 after being decorated for the Tour de France.